Instagram, Facebook and YouTube are all places dealers can test drive video ads. LAS VEGAS — Before dealerships invest in TV campaigns, they should consider testing video ideas on less costly digital platforms, such as social media hubs YouTube and Facebook, to see how consumers respond, suggested Peter Leto, Google’s head of industry, automotive retail sales, at the Digital Dealer Conference & Expo here in September. That was just one in an array of suggestions from Google and Facebook on how dealerships can approach video in the digital age. At the conference, the Silicon Valley giants shared tips on how retailers should tailor online videos to fit the consumption habits of today’s mobile-centric consumers. Video continues to be a critical research tool for car shoppers. For buyers who used online video as a resource, 96 percent watched a video of the brand they eventually bought, according to a January study from Google and comScore. In addition, Leto said 42 percent of shoppers will watch 30 minutes or more of video on their path to purchase. Meanwhile, Facebook users consume 150 million hours of video each day, which is more than Netflix. “We’re not talking about social media; we’re talking about mass media,” said Phillip Rather, Facebook’s head of automotive partnerships. Explain. Consumers are looking for videos that explain features such as Android Auto. People also turn to vehicle walkarounds; test drives; reviews; and do-it-yourself videos on topics such as how to change oil. Go bright. Make sure to use vibrant backgrounds and colors, especially in a mobile-first world where people are viewing on screens with different settings. Go fast. Tell the story quickly. Get to the point at the beginning of your message. Don’t wait till the end to try to hook consumers. Focus. “What is it that you’re highlighting in that vehicle or about your dealership? Focus on one thing in that video that you want the customer to walk away with,” Leto said. Get human. Talk to parents about safety features, or tout towing capacity for outdoor enthusiasts. Put ads in the viewer’s terms. Get out. Consumers identify with videos the most when vehicles are shown in natural environments, not showrooms. Experiment. Try TrueView pre-roll ads, where advertisers only have to pay if a consumer watches in full. People can skip the ads after five seconds. Dealers also should leverage data from their customer relationship management systems to target consumers on the site. Rather said Facebook also can more closely target audiences when provided with data from first-party sources such as the CRM or dealer sites. Frame your visual story. For automotive, in particular, Rather said, some think videos have to be shown in a 16:9 aspect ratio or that the entire car must be visible and make a lot of noise. But Rather said the most effective ads “have taken those types of TV assets [and] have framed them in a different way, which provides close-ups to the wheels, interiors. The way it’s framed is really important.” He said a 1:1 ratio works well in ad units on news feeds. Videos should get to the point within the first few seconds. Use text overlays to get the message across. Be effective with the sound off. Find people who watch six seconds of a video and retarget them with another offer later. 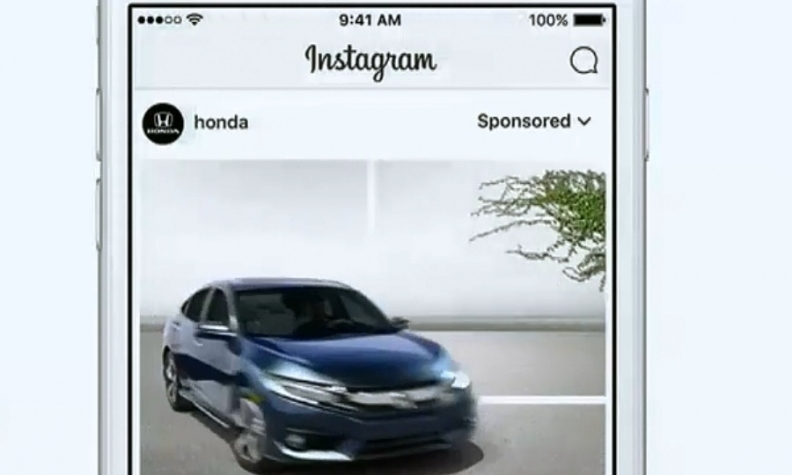 For Instagram, advertisers should experiment with ads that are “framed for visual surprises.” Rather highlighted Honda Civic Instagram ads that initially showed three panes, each with a different view of the car. Then the ads came to life as the car drove from the top pane and through the others before driving off the screen.